Looking for some a fun remote controlled toy boat for your kids? If so, you’re in luck. There’s never been a better time to get into this thrilling RC toy hobby – modern RC toy boats are safer, more durable, and cheaper than they’ve ever been before. You can find great radio controlled boats for kids as young as 6 and as old as 14, or even older! Of course, with so many great RC vehicle choices to pick from in the modern market, it can be hard to find the remote controlled toy boat that’s the best choice for your kids in particular. How do you know you’re buying something safe, durable, and fun? Something your child will love for a long time and not get bored with too quickly? Well, the Dronethusiast staff is made up of experts in all remote control vehicles, and we’ve picked our top 10 RC boat toys of 2019. This toy is able to operate in muddy water, water, sand, mud, grass, and pavement. It is designed to be used on all kinds of road surfaces that that most toys can’t go. It is an award winning remote controlled motor boat that has received praises from educators and qualified professionals. – You need to race it with toys that operate at the 49 MHZ to avoid interference. This cheap toy remote control boat is a great choice for young children. It’s the perfect size for pools or small ponds, it’s super easy to control, and it can even self-right after a capsize. If you’re looking for a simple, no-frills RC toy boat for kids under 30 dollars, look no further. A lot of people prefer to buy a remote control boat for pools these days, because in many areas it’s easier to find a pool than a pond or stream, and because using motorized toy boats in a pool avoids the dangers of saltwater damage. The best RC boats for pools are usually small and durable, so that if you hit against the hard edge of the pool it doesn’t cause much damage. Though any boats in the above section would be a good fit for this category, here’s a couple of our favorite remote control boats for pools. This is a super cool remote control boat toy for pools that kids just love. This set actually comes with two small kids motorized boats and a 3-foot by 4-foot pool to race them around in. For less than 60 dollars, it’s the perfect cheap gift for families with two kids and a backyard to play in. – The pool is tough vinyl, but the boats themselves are cheaply made. The Babrit F1 is a small radio controlled boat that’s even popular with adults, but which is simple enough for a child to use without trouble. It moves fast, has a decent battery life, doesn’t cost too much, and nearly never loses signal connection. The Mioshor H100 is an extremely stylish RC racing motor boat for kids with a durable waterproof hull, high-performance brushless remote control boat motor, and fast capsize recovery. It’s recommended for children aged 10 and up and is a popular toy with boat enthusiasts of all ages. – Super easy to use! Look. Sure. You can probably tell just by looking at this thing that the eMart RC Fish Boat Shark is not the fastest or most powerful RC boat for kids around. But it’s a great RC toy with a unique design that kids who love sharks will really enjoy. The tail of the shark even swings back and forth as it swims! This is a powerful high speed boat that is designed to reach speeds of up to km/h. It will splash other kids speed boats out of the water with its powerful after wash. You also get a warning when the boat’s battery is almost drained. The boat is made of an ABS plastic that resists tilting. – It combines speed and functionality to deliver an entertaining experience. – It has a battery low warning system. – Has a powerful hull and water cooled propeller. – It circuitry must be kept dry. – This boat is easy to pilot. – It maximum speed easily surpasses other boats. – Warns you when the battery is low. – It is exciting to operate. – You need to keep water out of its interior. – Water in its interior will cause a short circuit. 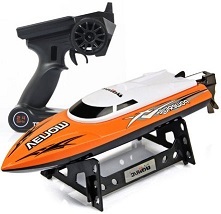 The Force1 H102 Velocity is a very popular remote control boat for kids. It’s very easy to sail, costs less than 100 dollars, and moves at a fast 20 MPH top speed. It also has some of the best self-righting functionality in the business and a great battery life. One of the best all-around remote control toy boats for kids who are old enough to enjoy it properly. – Also includes dry-dock stand, nose guard, extra propellers, and propeller lubricant. In other words, everything you need to keep your boat in top shape! – Though it’s powerful, it doesn’t have the most precise controls. The Cheerwing RC Racing Boat is a popular radio controlled boat for beginners because of its small size and large feature set. It has self-righting capsize recovery features built right into the hull, auto-corrects its own tilt, is water-cooled, and has built-in alarms for low battery or weak signal connection, all of which is great for kids. 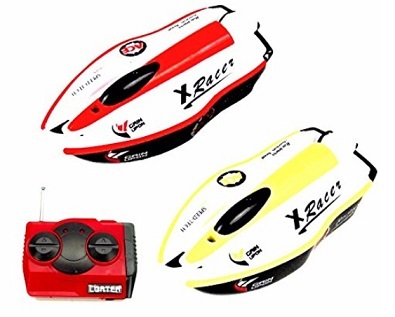 The Pro Boat Recoil is the fastest RC boat for kids on this list, and one of the fastest kids motorized boats you’ll find at this price point. It’s also large, uses a powerful brushless motor, and is a perfect choice for your 14+ year old who’s done with her beginner boat and is ready to move on to something a little more advanced. – Lasts only 10 minutes on a single battery, which is pretty low for this price range. Spares can be purchased on Amazon. What’s the best RC boat to buy for kids? 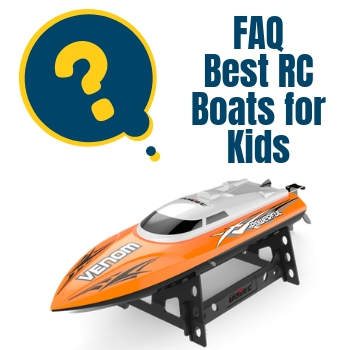 The best RC boat for kids depends on a number of different factors. What price range are you looking for? What age range? Do you just want a toy remote control boat, or something that can actually participate in a race? That’s why we’ve broken down our reviews above into categories. We hope it will help you find the best remote control boat for YOUR child, not just some “one-size-fits-all” option. There is also a selection of RC Cars for Kids that you can review in our article here. How do toy RC boats work? Are there saltwater remote control boats for kids? No. Remote control boats for kids are not designed to be used in saltwater, and their electrical parts will rust and experience damage if they are used in this fashion. Who sells toy boats for kids? 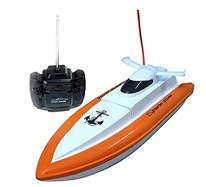 Remote control toy boats for kids may be sold in a store or by the manufacturers themselves. However, the best remote control boats for kids are usually found on Amazon. We’ve provided Amazon affiliate links for every product listed in this article to make it easy to shop for exactly the model you’re looking for. What is the range of the remote control for the boat? Remote control boats for kids usually have a range of 100-300 feet, on average. Some may have more or less, depending on the frequency used. How long do the batteries last in a remote controlled boat? Most remote control boats for kids will only last for about 10 to 15 minutes at most. The exact duration will depend on battery capacity, speed of operation, and range of the controller. A bigger capacity battery will power a boat for a longer period. However, boats for kids are generally designed with safety first in mind, and tend to be smaller and less powerful than RC boats designed for adults. How are the batteries recharged? The batteries in a remote control boat for kids are recharged using the chargers and adapters that come with the toy boats themselves. Generally, you plug one end of the charger into a wall outlet or USB port, then plug the battery into the other end. Does someone need training to operate remote controlled toys boat for kids? No training is necessary to operate one of the a toy remote controlled boats toy boat for kids. The boats come with a manual that is easy to read and the remote controller has an easy to use interface. The knobs have clearly indicated functions that make them easy to master. We hope this article has helped you find the best RC boat toys and best remote control boats for the kids in your life. We at Dronethusiast are passionate about all radio controlled vehicles and about helping to bring newcomers into this exciting and ever-expanding marketplace. 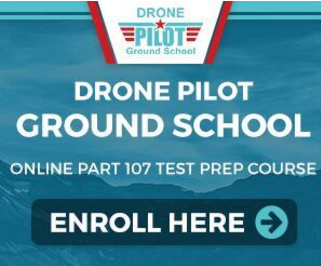 If you’re looking to learn about other types of RC vehicles, check out this great guide to drones. Did your favorite RC boat for kids get left off this list? Be sure to let us know in the comments and we’ll look into it right away!